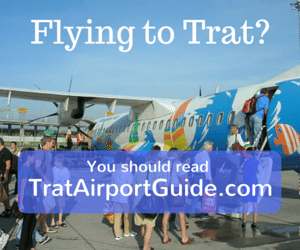 What can you see and do in Trat town? Trat is Thailand’s eastern-most province, bordering Cambodia along the Khao Banthat mountain range. The city of Trat serves as a launching point for visitors to the province’s 52 large and small islands, including those of Mu Koh Chang Marine National Park, whose long, white, sandy beaches have made Koh Chang one of Thailand’s top ‘get away from it all’ island destinations. Trat province is the easternmost in Thailand and borders Cambodia. 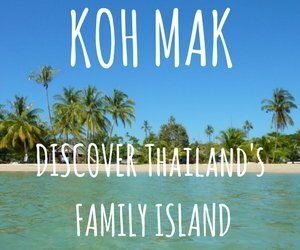 In the past the area was an important stop for sailors but nowadays it;s best known as the hopping off point for the islands of Koh Chang, Koh Kood and Koh Mak. Very few people choose to stay more than a night in Trat town . However, if you aren’t in a hurry and want to sample some local life then it’s definitely worth a couple of days of your time. There’s cheap accommodation in modern hotels and also a range of budget guesthouses in the old quarter by the riverside. The town is also well known for it’s bustling night market which is a foodies paradise. Trat is around 315Km from Bangkok and can easily be reached by public buses from Ekkamai and Morchit bus stations and also by plane. Bangkok Airways fly 3 times a day to their private airport 30Km from Trat town. The climate in and around Trat is one of the wettest in the country. From may to october the rainy season can deposit as much as 1,000mm per month on the mainland and islands. The upside is that this is a very fertile, green area of the country. You wont see any of the parched landscapes that can be found in the north. It is one of the main fruit growing areas of the country with the main fruit harvesting season being March to August. Trat has a rich history and it’s population has long been a mix of Thai, Lao, Chinese, Khmer and Vietnamese. In 1904, Trat was briefly annexed by the French army who were then in control of a lot of Indochina. However, it was soon handed back in 1907 in return for border land and what is know the town of Siem Reap. When you visit Trat you will see the old Siamese flag, depicting a single white elephant on red background flying all around the town. This is to celebrate the province’s independence. For those looking to kick back and save some cash, Trat town is one of the cheapest destinations in Thailand. It’s still not too difficult to find a private fan room and three cheap meals for a couple of hundred Baht. And if you need a little more luxury, the town’s best guesthouse – the Rimklong Boutique Hotel – is around 1,000 Baht / night. Other new hotels in the town centre include Trat City Hotel, Toscana Resort and Chivapuri Residence. All are around 1,000 – 1,200 Baht/night for a modern hotel room. Trat town centre is a centred around the indoor market. 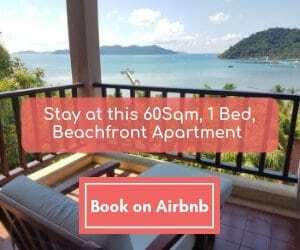 From here you can take a songthaew to the ferry piers for Koh Chang or a kilometre out of town to the bus station, from where it’s easy to head to Bangkok or the Cambodian border at Hat Lek. The streets in the town centre are lined with ‘Mom & Pop’ stores selling everything imaginable. The architecture tends to be drab, grey shophouses but there are some hidden gems as you approach the riverside area. 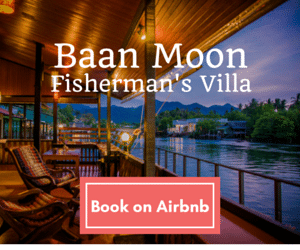 It’s here that you will find a much more charming area with old wooden homes lining the narrow streets, some of which have been converted into budget guesthouses, coffee-shops and small restaurants. From Bangkok, take Highway No. 34 (Bang Na-Trat) or Motorway to Chonburi, then use Highway No. 344 (Ban Bung-Klaeng) Arriving at Klaeng, turn onto Highway No. 3 and proceed to Trat. The total distance from Bangkok to Trat is 315 kilometers. Both air-conditioned and non air-conditioned buses depart from Bangkok’s Eastern Bus Terminal (Ekamai) to Trat every hour from 6 a.m. to midnight. From Bangkok the buses to Trat cost 209 baht for 1st class air-conditioned buses (182 baht for 2nd class) and 247 baht for 24-seat VIP air-conditioned buses or 113 baht for regular buses. The trip takes five to six hours by air-conditioned bus or about eight hours by regular bus. For more information, contact Transport Co. Ltd at Tel: 0-2391 -4164, Choet Chai Tour Tel: 0-2391-2237, Chok Anukun Tour Tel: 0-2392-7680 and Suppharat Tour Tel: 0-2391-2331. Several non air-conditioned buses leave daily, starting from 07.00a.m.-11.00p.m. Fare is 78B (Tel.02 391-2504). Air-conditioned buses leave every 1.30 hours, starting from 07.00a.m.-11.00p.m.. Fare is 140B (Tel. 02 391-4164). From Chanthaburi to Trat, the regular bus takes about an hour. Ferries depart either from Ao Thammachat Pier, or Centre Point pier between 06.30 a.m. – 07.30 p.m., with a travel time of 30 – 45 minutes. Foot passengers pay 80 Baht one way on either of the ferries.